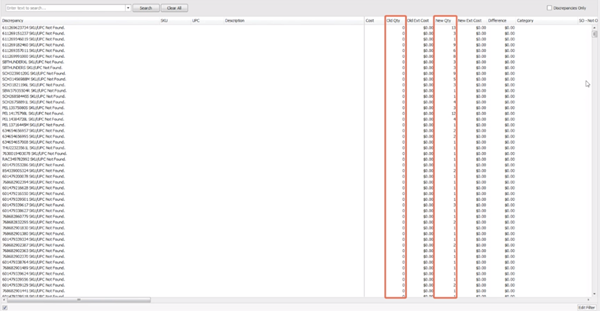 Once you've imported those files into Ascend, it's time to analyze the results! The Old Qty column is what Ascend currently has recorded for that product. The New Qty column is what was scanned during your inventory process. This is what the Quanitity on Hand will update to after you click the Reconcile icon. Make sure to verify these quantities and changes in quantities before reconciling! Reconciling can not be undone. As you look at the columns, you might see some products that are not in-stock on the list, marked as Not Scanned. Some of this might be because Ascend pulls your negative inventory in, so don't freak out! Speaking of Not Scanned, check out your first column. These are your discrepancies, AKA issues that need to be resolved before you continue. Check out this document to learn how to resolve those discrepancies! 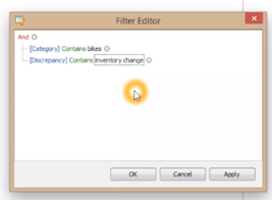 If you're a seasoned inventory pro, you might not need the Edit filter, but for the rest of us, it's a huge help! The filter lets you drill down to the Category level and look specifically at products that were not scanned or had an inventory change within that category. The filter is especially useful when investigating discrepancies in high-dollar categories, such as Bikes. 1. 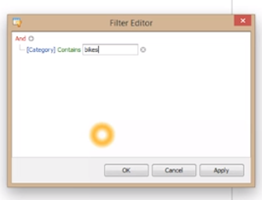 Select Edit filter in the bottom right corner of the screen. 2. Select the plus sign in the pop-up window. 3. This lets you create a query to find the items you are going to work on. 4. 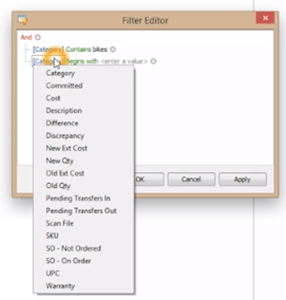 You can change the blue filter if needed, to one of severasl options, including Category, Discrepancy, SKU, and more. 5. You can also change the green constraints field to one of several options including begins with, contains, is blank, and more. 6. Now in the gray 'enter a value' field start typing a portion of the Category name (if you chose Category for the blue filter). 7. 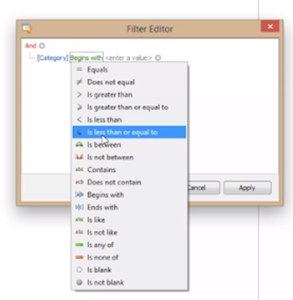 You can select the plus sign again to create another set of filters for your query. You can create as many filters as needed. 8. Once you're done, select OK.
9. We suggest selecting Export to export the list to excel, where you can print it and use it during your investigations. a. Rename the Excel document and save it somewhere you can find it. b. Delete all columns besides Discrepancy, SKU, UPC, Old Qty, and New Qty. c. Use landscape view to print the file. 10. Go investigate the discrepancies. We suggest keeping notes on your printout, but remember you will need to go back into the Reconcile screen in Ascend to make those changes! Quantity changes made in the Reconcile Inventory screen are not saved if you exit the Reconcile screen without saving (and you shouldn't save until everything is fixed!). The [Barcode] SKU/UPC Not Found discrepancy may require the user to exit the Reconcile Inventory screen, so resolve that discrepancy first!